Chuckie Duff, left, and Ariel “Ari” Bracamonte are Tucson’s newest nerd heroes. Punching large buildings until they fall down, blasting away alien invaders and going bowling with the Simpsons family. Soon, it will all be in a night's work for Tucsonans, once Cobra Arcade Bar has its grand opening on Friday, June 29. 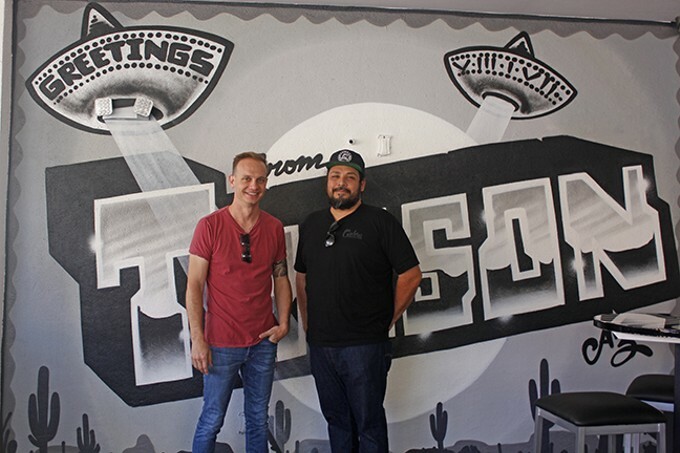 The original Cobra Arcade Bar opened in downtown Phoenix in 2016, thanks to the creative vision of co-founder Ariel "Ari" Bracamonte and Chuckie Duff, the guy who Bracamonte says gave him a chance to do it. It was the culmination of years of collecting and refurbishing vintage video game consoles, developing a look and feel for the place and thinking of the perfect name (actually, that part was pretty quick. Duff says a group got together to throw a "naming party" at Peter Piper Pizza, and everyone just yelled out names until they found one they all liked). It was a smash hit, and they soon started looking around for a place to open a second location. "Tucson," Duff says, "seemed obvious." Bracamonte, who says he plays a mean game of the WWII-themed 1943: The Battle of Midway, was developing the idea for Cobra long before it opened. He started collecting vintage arcade games around seven years ago, before he even had anywhere to put them. "I just started collecting them, trying to open this," he says, gesturing around the mural-covered walls in Tucson's new Cobra location. "They were in my house at first—in my backyard, in my living room, dining room." He's amassed his collection of more than 350 games by scouring the internet and attending auctions. He's made friends all over the country in his search. And that idea of games bringing people together, like at the arcades he used to hang out when he was younger, is sort of what he loves about this business. "Everyone would meet up at the arcade," he says. "It's fun to play Streetfighter with a stranger." Unlike the arcades many people spent their childhoods in, Cobra Arcade bar is, well, a bar. They've got drinks like the lemon-limey Blanca and the whiskey-and-banana Krazy Kong, and local beers on tap from places including Dragoon and Barrio Brewing. But for Bracamonte, who isn't a drinker, the main attraction really is the selection of games, and the creative opportunities they present. Most of his friends are artists, so he's a big fan of supporting local art. Street artist EL MAC did a 20-foot mural on the outside of the building, for example, and Lalo Cota, Danny Martin and Rocky Martinez (aka Cyfi) all contributed art to the location as well. The walls are covered in murals, the bathroom doors are sights to behold and even the tabletops were painted by bartenders from Phoenix. The sides of some of the game cabinets are decked out with art by artists Bracamonte has known for years. There's something about the enormous cylindrical ceiling lights that makes you feel like you're in a videogame yourself, and something about getting a handful of tokens that say "Cobra Arcade Bar, Tucson Arizona" on one side and "No cash value" on the other, that make you feel like you're a part of a secret, exclusive club. Duff says that, while they were expecting the original Cobra Arcade Bar to have something of a brewery-type atmosphere, it's become more of a nightclub, with lines out the door most Friday and Saturday nights. They took that into account when they were scouting out this location. The building, most recently home to The Junxion Bar, has two stories, a DJ booth and lots of neon lighting. But don't worry: They promise there will never be a cover charge to get in. "Whatever we did in Phoenix, we did it better here," Bracamonte says. "Size, the video games, more pinball, the art, the neon." Not to mention that, while Bracamonte has about 100 games in Tucson, only half of them are in Cobra Arcade Bar at any one time. He plans to rotate out a half dozen or so of the games five to six times a month, so the experience for patrons is always new. Even people who have played every classic arcade game in the book will be in for a treat when they find games originally designed for PC or home console play, like the indie game Cuphead and the new Dragonball FighterZ game, in cabinets custom designed and built by Bracamonte. The bar's logo, designed by Victor Vasquez, has (obviously) a cobra in the center, flanked on either side by Chinese characters that spell out exactly what the downtown hotspot's future customers need to hear: "Good luck" and "good battle." Cobra Arcade Bar is located at 63 E. Congress, and is open from 4 p.m. to 2 a.m. Monday through Sunday. 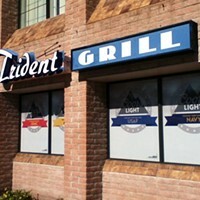 The grand opening is Friday, June 29.